If you’re an amateur mechanic or someone that doesn’t know a lot about car technology, then researching the best devices to use for your car can be difficult. Articles explain what certain devices are for but sometimes it can be too technical for you to understand. How are you supposed to find the best cheap products for your car when there are too many technical aspects? 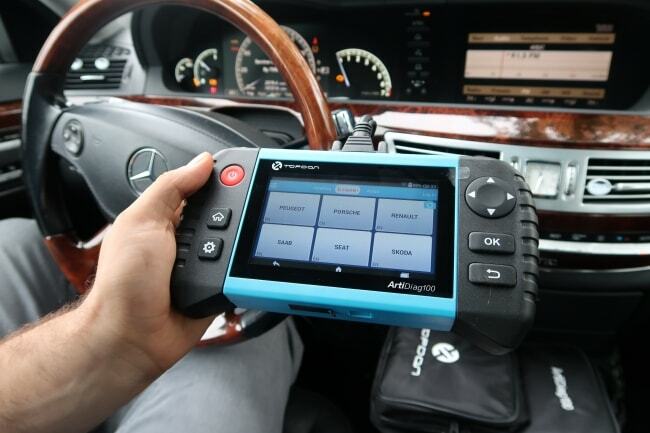 In this article, we will not only explain in simple terms what an OBD2 scanner is but we will also explain which ones are the best value for money. That gives you insight into the topic and you’ll be able to work on a budget. To start becoming a pro, keep reading. The Difference Between OBD2 and CAN? 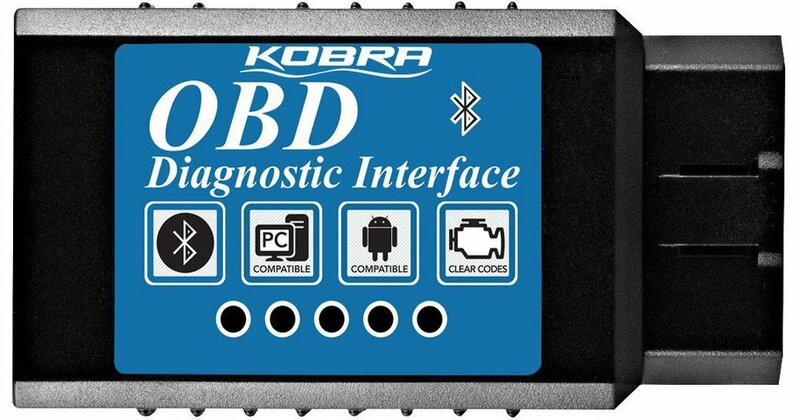 Which OBD2 do You Need? How Does OBD2 Data Logging Work? An OBD is an on-board diagnostic that’s integrated into your vehicle’ s self-diagnostic system. This technology is designed to indicate when something needs to be done on your vehicle, as there is a technical issue that requires your attention. A mechanic will then use an OBD2 scanner to connect to your vehicle’ s diagnostic system to find the problem. By doing this a mechanic is able to read the diagnostic trouble codes (DTCs) to understand the problem without having to remove car parts. The OBD system originated in California. The California Air Resources Board (CARB) started using OBD in new cars for emission control purposes. By 1994 CARB made it compulsory for all cars to have an integrated OBD2 system in all vehicle models from 1996 and upwards. Today this system is standard in most vehicles. OBD2 is known as a higher level protocol, almost like a language whereas CAN bus is a method of communication. The OBD2 can use up to five different signal protocols for communication. Since 2008 CAN Bus has been made a compulsory protocol for all OBD2 cars in the US and is standard for cars & light vehicles. If you want a data reading from your car it’s helpful to understand the basics of the messaging structure. An OBD2 has an integrated identifier and data. The data is split into Mode, PID and data bytes. You can convert this data using an online program to confirm the result of your message. The identifier is a standard 11 bit and it’s used to differentiate between request messages and response messages. This reflects the length in the number of bytes of the remaining data. For message requests, the data will be between 01-0A. For responses, the 0 is replaced by 4 (i.e. 41, 42, 4A). There are up to 10 modes. Other modes are used to identify diagnostic trouble codes and show freeze frame data. For each mode, a list of PID’s exists and each PID has a description. Some have conversion formulas such as Ah, Bh, Ch and Dh which are the data bytes in HEX. These will need to be converted to decimal form before they can be used in the PID formula calculations. An important thing to note is that not all cars support PID’s, especially older model cars. For the hobbyist, the OBD2 data can be helpful and an interesting bit of information. You will find many OBD2 devices that can give you access to this data in many different ways. 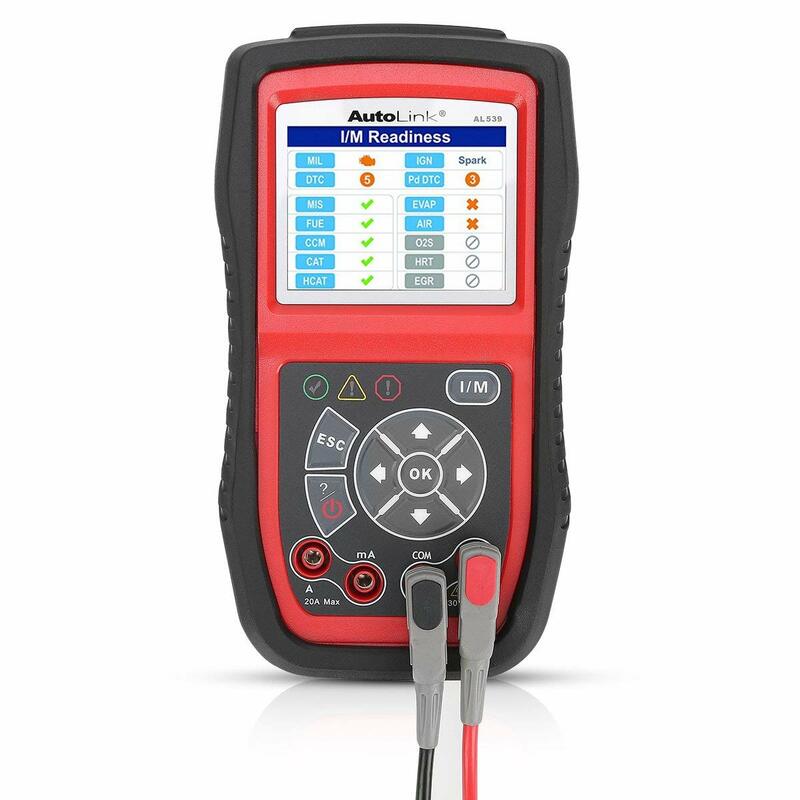 These devices are used in static reading and clearing of diagnostic trouble codes. The OBD2 scanner is used by mechanics to find an underlining issue behind a malfunction indicator lamp (MIL). These devices vary by their degree of code coverage and features. This device is used to log OBD-II data from a car and place it into an SD card. This can be helpful to analyze patterns and correlations. A data logger gives you a black box view of patterns before and after the diagnostic code has started. These devices have integrated Bluetooth and Wi-Fi features that can help with fuel efficiency. These also prevent unsafe driving and allow remote diagnostics through the OBD-II supported parameters. This device is used to provide real-time data on various OBD-II parameters. This can include visual applications and displays that guide a driver on fuel & driving performance. High end models can even provide a live health check. Now let’s look at a few options on the market. Why we like it: This tiny device is everything you need in a diagnostic scanner. It comes with a full customer support system and reads & diagnoses codes rapidly. It’s 100 % approved by mechanics around the globe. This scanner device can work on any Android and Window device, making it simple for you to download & install the app. It works on all vehicles from 1996 onwards. The Kobra ELM327 comes with an app allowing you to download it on any Android and Windows system. This device also comes in two models. The Bluetooth model only works on windows and Android whereas the Wi-Fi model with Apple as well. The Kobra ELM327 quickly connects to ECU & easily reads and diagnosis codes. It has no trouble resetting the check engine lights and it rapidly retrieves both manufacturer-specific & generic DTCs. The Kobra operates on many different applications such as the Torque app, ScanMaster Lite and the OBD Car Doctor app. These are easily available to download onto your SmartPhone or tablet from the Google or Windows Play Stores. This device is a 16 pin OBD2 connector that you plug into your car and connect to any application of your choice downloadable from Google or Windows. It is 1.76 ounces in weight and 4 x 2 x 1.2 inches in size, making it quite a portable unit. Although this tiny scanner can fit in the palm of your hand, it gives you all the services you need to properly maintain your vehicle. Accompanying the stylish black plastic device there is a 16-bit adaptor piece with nonslip grip grids on the sides of the scanner. That makes for easy grip even if your hands are slippery from sweat or oil. Why we like it: This device might be tiny in size but it makes up for it with its dynamic diagnostic reading abilities and it’s the cheapest on our list so far. There’s no telling what you can do with the Foxwell NT201 in hand. 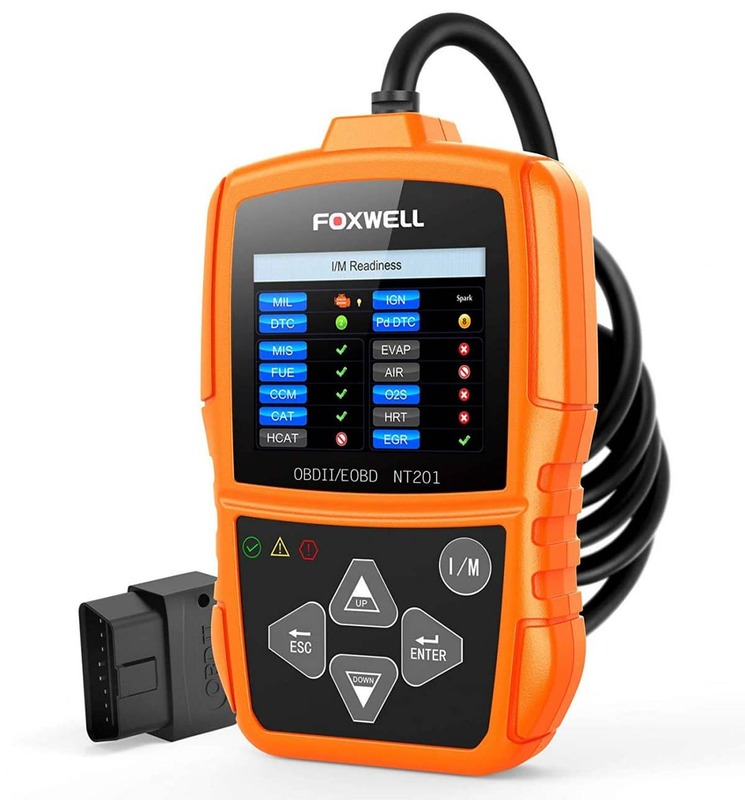 If you’re a mechanic and you’re on a time sensitive project and you have many customers lined up, the Foxwell is sure to help you get the job done fast & accurately. This device comes with an adapter so you’re able to plug it straight into your vehicle with no hassle. It also comes with a USB cable so you can plug this into a PC to update your software. It also comes with an added EOBD Code Reader and a lifetime of free software. You can download and install the app from the Foxwell official website effortlessly. With this device, you can receive definition codes directly without using Google or DTC dictionary. Fix any problems directly without going to a professional mechanic. It has multiple operating systems that you can use such as Windows 98 to Windows 10 and VISTA. You can receive live data in text and graph making this scanner more user-friendly. This product works well with all OBDII/EOBD & CAN compliant cars, light-duty trucks and SUV’s sold worldwide. The Foxwell reads freeze frame data, reads engine fault codes and effortlessly determines the cause of MIL. This turns off the engine light and erases the fault codes after the issue has been dealt with. This device can read and erase codes as well as give you an extensive view of your vehicle information. It has a 2.4-inch color screen and comes with dimensions of 4.8 x 2.8 x 0.9 inches weighing 6.5 ounces. With the relatively large screen it’s a user friendly option. The Foxwell gives you live data and unit of measure. You get full diagnostic reports for possible causes of the problem and additional resources for repairs. It can also do smog checks and live data. All of this gives you a comprehensive tool to find solutions. The Foxwell NT201 has a bright orange and black plastic exterior with a bright screen to clearly display your data. It comes with a cable and adapter while the five button display interface with a quick one click I/M button for emission tests makes for easy usage. Why we like it: This OBD scanner has a bright screen with easy to understand navigation. It has excellent graphics for a standard OBD scanner and it’s easy to understand. This device has a nifty USB port so you can export all of your data onto a PC or laptop. With your export data, you can compare the old results with your new results to see if there has been an improvement in your vehicle’s diagnostics. It’s a quick solution as it can connect to your vehicle, find vaults rapidly and erase them without any hassles. Unlike most OBD2 scanners this one comes with a USB port for easy PC connection which helps with updates and data storage. It also comes with an easy to understand instruction manual. You can set this device to several different languages such as English, Spanish, Dutch, German, Japanese, Polish and more, making it relevant worldwide. This powerful diagnostic tool can read and erase codes easily. It’ s capable of retrieving vehicle information such as your VIN, CIN, and CVN, & perform ignition test. It can determine the MIL in both generic & manufacturer specific vehicles. This device doesn’t need an electricity or battery power source as it gets the power straight from your vehicle. That means you can use it anywhere. The Autel AutoLink AL319 has a bright LCD color screen for better viewing. Its size is 63 x 17.7 x 92.5 inches and it weighs 1lb; Another portable unit to keep on hand at all times. This device has an all red plastic exterior with grip notches on the side so it won’t slip from your hands. The simple three-button interface—with I/M readiness key, enter button and scroll button—makes for easy navigation. The three-light diagnostic display of red, yellow and green will clearly tell you the overall health of your vehicle so there’s not doubt of when you need to take action. Why we like it: They call the SeekOne Sk860 a professional car doctor. With the precision of a surgeon, this device is able to pick up faults quickly and easily making the life of a mechanic that much more simple. This device works on most vehicles sold in the USA since 1996 and supports all OBDII protocols. It supports a multitude of languages such as English, German, Italian, Russian, Portuguese, Dutch and Spanish. The SeekOne Sk860 comes with a lifetime of free software updates and you can print your data by connecting the device to a PC. That’s an easy way of keeping record of your car’s history. It comes with a USB cable for connection, a durable carry bag and adapter cable so you have everything you need to get started & take care of your device. It has a readable data stream and can graph data from 1996 vehicles & newer, giving you a clear DTC data. The SK860 can read vehicle information and transmit it rapidly such as the vehicle’ s VIN, CIN, and CVN. It does test data reviews as well as check the battery of your vehicle. You’ll appreciate the troubleshooter code tips guide for simplicity. The device can also turn off MIL and reset the codes. This device measures 7.8 x 3.8 x 1.2 inches and 11.2oz which makes it quite heavy for a handheld device. It comes with a 58” cord and 2.8” color screen. The SK860 comes with an I/M pre-inspection readiness key for a quick overview of your diagnostics. You can use this for over 43 car manufacturers as well as generic codes. The SK860 is quite bulky with rubber bumpers, but this makes it durable too. The eight button navigation system with a bright screen makes navigation easy. Why we like it: The Topdon TD309 may be a small compact device but it’s powerful and extremely easy to use. It has all the functionalities you need to check your vehicle on a regular basis. This device is easy to store because of its small stature. You can store it in a center console, a toolbox, a carry bag and even in the glove compartment. 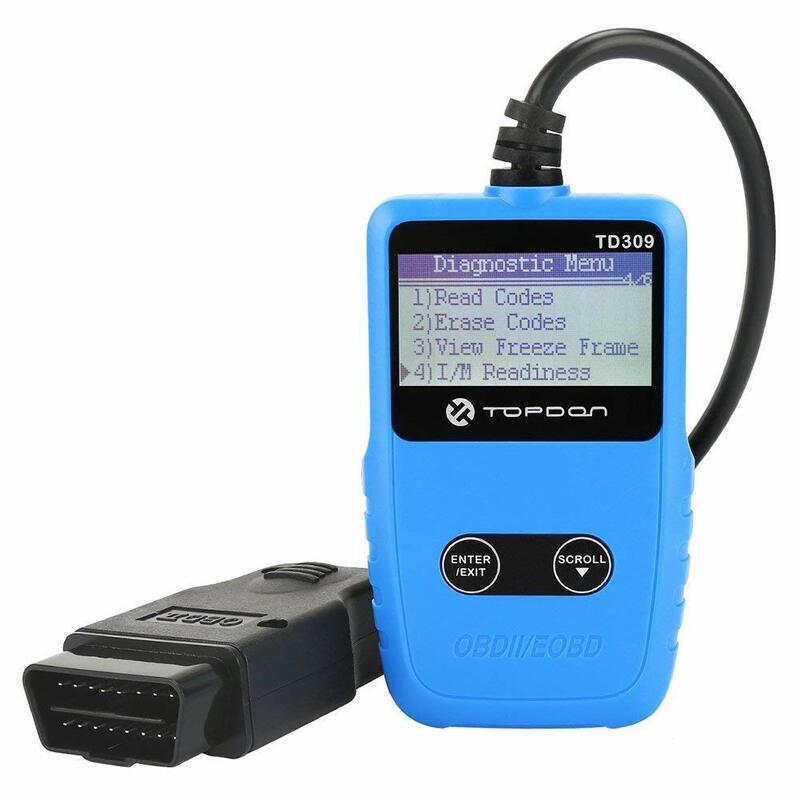 The Topdon works quick and can connect to your vehicle in less than six seconds. The Topdon comes in a plastic cover with all the details at the back on how to use your device. It, unfortunately, doesn’t come with a user manual but you can go online to see how this device can be used. This tiny powerful device can read and display DTCs rapidly as well as erase them at the click of a button. It reads and displays I/M monitor status & allows you to view freeze frame data. Your car information such as VIN numbers are available easily. This device is basic to use as it has one input. That makes it perfect if you don’t want to deal with complicated wires and adaptors. The Topdon is a small device with a size of 4.3 x 2.6 x 0.7 inches and weighing 5.1oz, making it comfortable to handle. It supports five protocols such as ISO 15765 CAN, SAE J1850 PWM, SAE J1850 VPW, ISO 14230-4 KWP2000, and ISO 9141-2. The Topdon has a baby blue plastic exterior with a bright LCD screen. The two button display helps you navigate through all the options on the display screen effortlessly. Why we like it: When you sync the Fixd OBD-II to your SmartPhone you can monitor your car and your entire family’s vehicles too. This helps you keep your vehicles in check as the app will inform you if there is anything seriously wrong with one of them. This is an essential piece of technology as it can save you money by letting you know what the problem is before the damage gets too bad. It also ensures the safety of you and your family when you’re on the road. This small scanner comes with an app that you download straight onto your phone after you’ve plugged the scanner into the diagnosis port in your car. There are no vague lights and no technical definitions, simply a small scanner that reads information & allows you to read the diagnostics on an app. The app has some add-ons which teach you about fixed roadside assistance. Thanks to wireless syncing with your SmartPhone so you can use the app wherever you are. The app is easy to understand as it gives you a direct timeline of your car and how to take care of your vehicle. You can view in real-time the severity of the situation and how to fix the problem proactively. A user can see the severity when the check engine light comes on and detects how many problems there are as well as how to fix them. The Fixd scanner has continuous monitoring which alerts you whenever there is a problem, empowering you to always be in control of your vehicle’s maintenance. The Fixd app also gives you a vehicle timeline which alerts you whenever your car is due for a service. The Fixd scanner app has a multi-vehicle function so you can sync more than one car to it. It’s a great all rounder as it reads and clears your check engine light, reads enhanced codes, gives you diagnostic reports and has an integrated logbook so you can keep track of the maintenance of your vehicle. The Fixd OBD-II is a small white adapter. 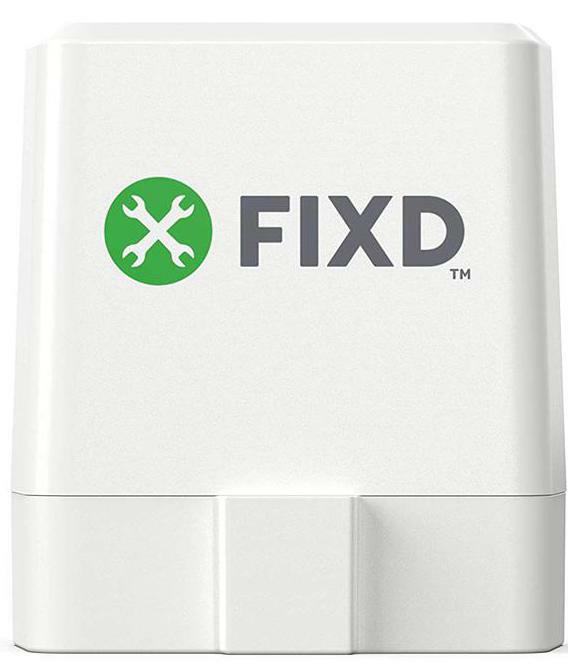 It has no wires, screens or buttons; however, it connects to SmartPhones and tablets allowing you to use the Fixd app. Why we like it: If you want a simple device to help you learn about car diagnostics then the Innova 3040e+ is for you. It’s perfect for car hobbyists and people who prefer to maintain their own vehicles. It helps you understand fault codes more accurately as it explains what these codes mean. The device will also give you advice on how to fix the fault codes. This device comes with an easy to use app called RepairSolutions free of charge. Via this app you’ll be linked to videos to help you solve your vehicle problems. You also get a break down on repair costs and verified fixes. Enjoy the benefits of live data to give you an accurate reading of your diagnostics. It has a quick erase code clearing to help you work faster. It resets the oil service light on most 1996 and newer manufactured vehicles. This device can also test your battery and alternator for performance diagnostics, making it quite versatile. Use this with multiple operating systems such as Windows XP, Windows Vista, Windows 7 and Windows 8. It measures at 6.8 x 3.5 x 1.1 inches, weighing 8.9oz so it’s reasonable in size. It also has a 3” color screen; one of the more impressive on this list. The 30” cord gives you freedom to move around while working. The Innova has a black plastic exterior design with nine blue buttons interface. The latter can be confusing for newbies. The black cover won’t show dirt easily, making it practical for regular use by professionals too. Why we like it: This OBD2 Device is able to detect electrical problems inside your vehicle, which is something most OBD scanners can’t do. 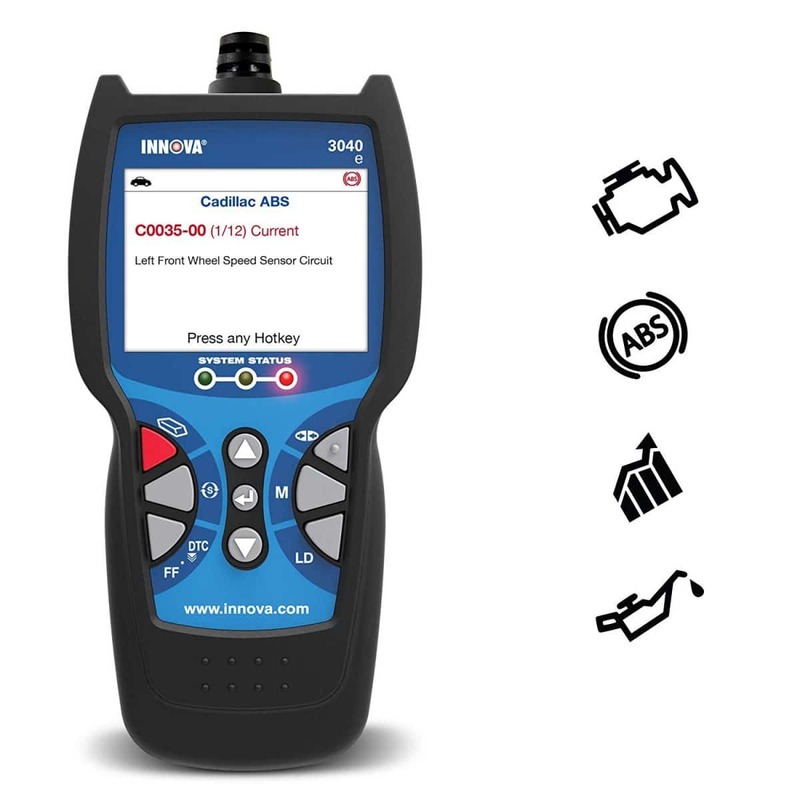 This OBD test tool supports all 10 modes of OBD-II and it features a unique one click I/M readiness key. This versatile device is designed for simplicity ensuring rapid and accurate diagnostics for timely repairss. 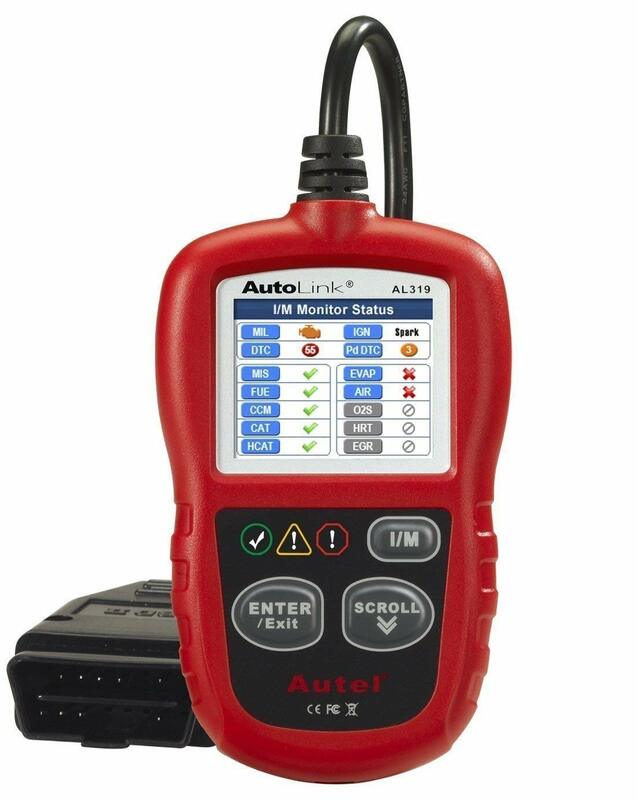 The Autel AutoLink AL539 has a 12V charging system and a starting system with a condition & discharge battery that other designs didn’t have before. It also has a pull out leg so the device can stand on its own. The AL539 also comes with a padded case and PC software. This makes it a comprehensive solution. The AL539 has a bright color-coded LED screen with built-in speakers for visual & audio specifications. There is also an I/M hotkey which allows you to rapidly enter I/M readiness. It supports a DTC look up and allows you to print your data via a PC for easy record keeping. The AL539 has an all rubber exterior and it’s smaller and lighter than many, also excellent for ergonomics. It’s a 6.7 x 3.6 x 1.4 inches design with a reasonable weight of 10.6oz. It has a 2.8” color screen with major function display so it’s easy to read feeback. Once again an eight key interface could seem complicated for some users. This is easy enough for anyone to understand. 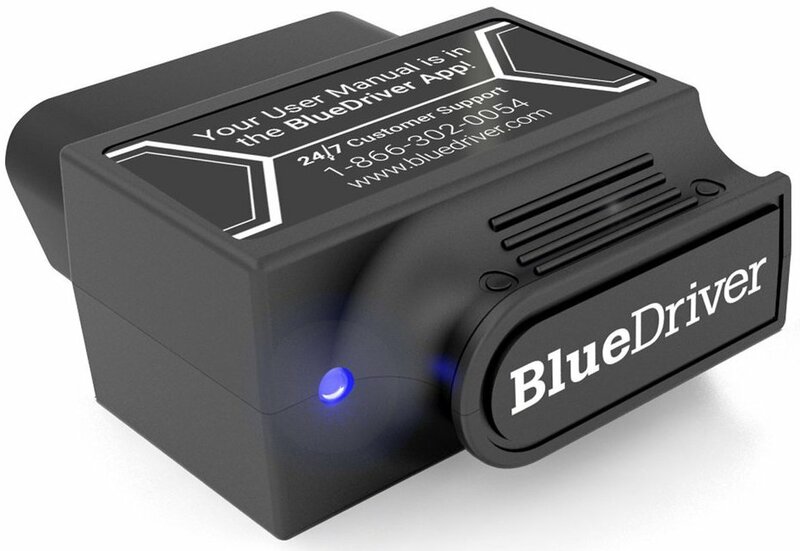 Why we like it: The BlueDriver has all the functionality of other OBD2 devices with some extra features. It gives you complete diagnostic information such as ABS, airbags and climate control. 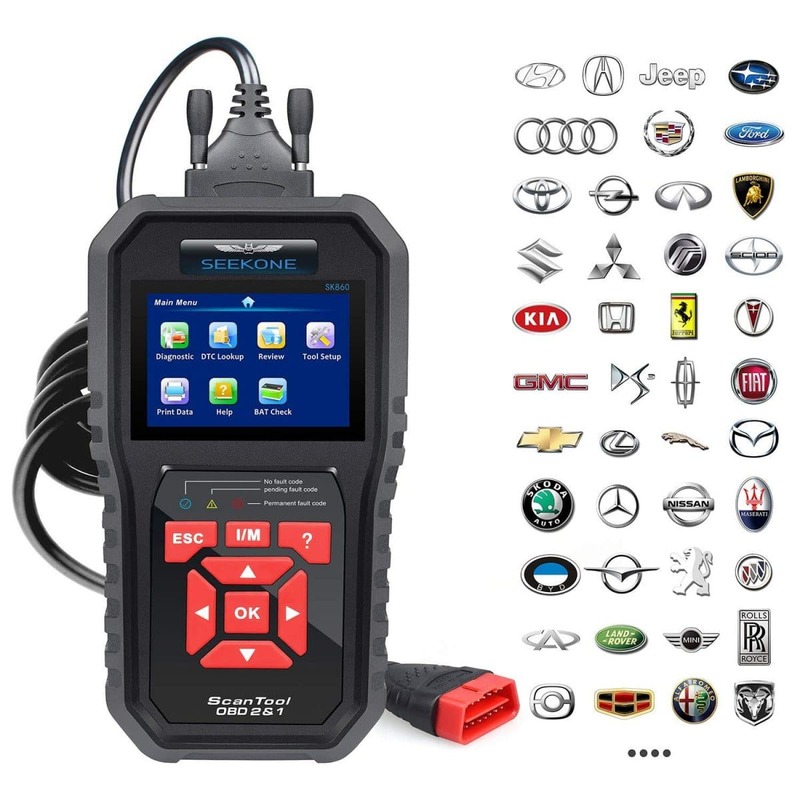 The enhanced diagnostic gives you access to all the information that only a professional mechanic can bring up with the most expensive scanners. The brand continues to update all their software so you can have an updated version on your scanner at all times. The BlueDriver Bluetooth Pro includes an official certified license for Apple and Android devices so you can bring up your diagnostics on your phone. The BlueDriver app and BlueDriver sensor work hand in hand to ensure the quality of your readings. The scanner has an unlimited free vehicle specific repair report generated from a database that’s verified by ASE mechanics. This device not only scans and gives you feedback on potential problems, but it also gives you suggestions on how you can fix these issues. The scanner has a simplified code reader with all the functionality expensive scanners have at a fraction of the cost. It can read and clear CEL codes as well as enhanced codes. It’s quite user friendly thanks to graph gauges and digital readouts. The BlueDriver is compatible with IOS and Android handsets making it easier for you to load & store data no matter the phone you own. It’s quite advanced as it can determine whether the vehicle is ready for a smog test. You can save all your data to a CSV file as an easy storage option. Parts are all designed and manufactured in North America & have no wire attachments. This device looks like an adapter and has no screens to easily view feedback, but of course you can use your SmartPhone as long as it’s compatible. When you receive the device, there will be a QR scanner on the box which allows you to go straight to the application. Why we like it: The Nonda ZUS saves you time and money with its easy to install & fast troubleshooting action. The Nonda comes with some of the best software and gives you the finest customization options that not many other applications can offer. This device is small but it’s easy to install and remove making for hassle free usage with its ergonomic design. It connects to your vehicle fast without any complications. The app installation is fast and it has a user-friendly interface. 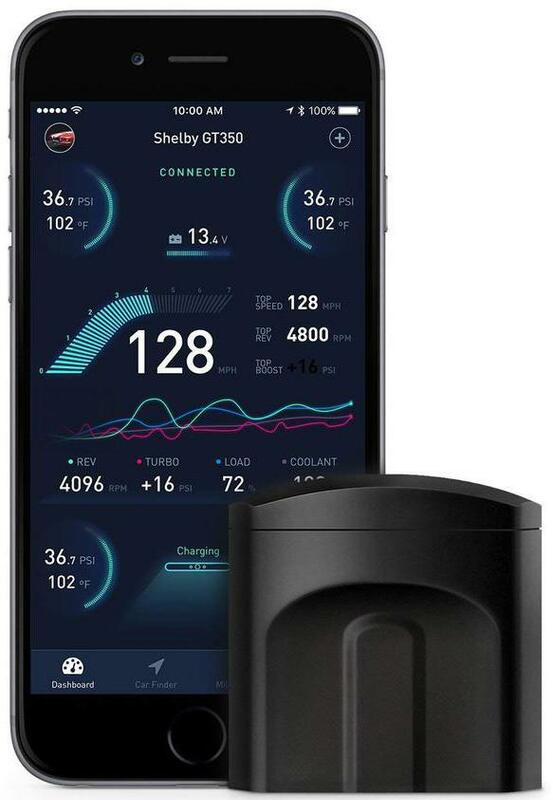 This has the world’s first predictive algorithms which help with your safety as it can pick up when there’s something seriously wrong with your vehicle. It comes with a free to install ZUS application that is downloadable with regular updates, so you always have access to the latest features on the market. It also has an integrated tracker in case of vehicle theft. This can determine the health of your engine and give continuous monitoring of your vehicle’s overall diagnostics. The app will alert you instantly if it senses any problems with your engine. It can read error codes and with the app’ s smart interface, you can quickly erase these codes after fixing them. The app that’s connected to this scanner has a three-light health indication. The app is fully colored so it’s easy to see which error codes have been eliminated and which ones still need to be fixed. The app connects to any Android 4.3 or newer and iOS 8.0 or newer software. This compact device is only 1.7 x 1.6 x 0.8 inches and weighs 0.6oz. It’s impressive that the brand still found space for LED status lights. Now that you have options of which OBD2 scanners are the best on the market at affordable prices, you can decide if you want to invest in your own scanner. The alternative is spending money on this service whenever there’s a problem with your car. If you’re still not sure how to use one, then we can give you a short break down on how an OBD2 scanner can benefit you. In this section, we will explain the benefiting factors of owning your very own OBD2 scanner and why it’s important to invest in these modern devices. We all know that taking our vehicles to mechanics is convenient when we don’t know much about cars but having an OBD2 scanner can save you that extra bit of cash. Sometimes the problems that cars have are minor and can be solved without using a professional. As you can see many of the products mentioned above have alert modes. These can prevent accidents or breakdowns on the side of the road. If you know the diagnostics of your car before going for a drive it can prevent you being stuck in the middle of nowhere, because you know to tend to the problem before it becomes a crisis. Fortunately for you, you don’t have to be a professional mechanic to use an OBD2 scanner. They’re easy to understand. It’s a vital diagnostic tool that provides you with simple information, helping you get the job done fast. Mechanics obviously care about diagnostic trouble codes as it helps them find the problems inside your vehicle hassle free. A nonprofessional may also find the OBD2 useful if you know how to operate one and to connect it to your car. You can then troubleshoot with your own car without the assistance of a mechanic. Basically, all you have to do is connect an OBD2 scanner or data logger to the OBD-II 16 pin connector in your car. Using this tool you can enter “request message” transmitted via the CAN-bus. The relevant ECU then reacts and sends response messages via the CAN-bus. It’s important to know this because you won’t see OBD-II data if you plug in a silent CAN logger. To log OBD-II response messages your OBD2 logger must be able to send the request messages. OBD2 has a broad range of parameter IDs that can be extracted from most regular cars. You can get a readable set of live data on your car on a computer system. Some of this data can be available outside of an OBD2 protocol but these CAN messages can be proprietary. This means you will need a system that can convert the data or parameters which is not always available. If you’re not a mechanic and simply collect cars as a hobby accessing this data can be difficult which can result in CAN sniffing or hacking. The OBD2 standard is the most basic and convenient way to access data from your vehicle. It’s a tool for everyone: Male, female, professionals or hobbyists. Either way, OBD2 scanners are amazing pieces of technology and here you saw they’re inexpensive. Spend a little money and enjoy owning a car a lot more thanks to your OBD2 scanner.